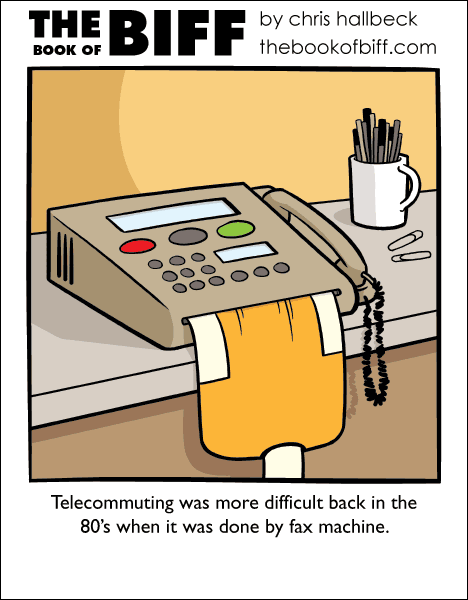 I remember being excited when we got a fax machine back at the first place I worked. The excitement quickly wore off when I realized there wasn’t anything fun to do with it. It was kind of like back in 1994 when I was the only person I knew in real life with an email address. I like how the fax machine’s got that yellowy-brown color that white computers and other electronic things usually get as they age. Reminds me of our first computer, that we threw away at the garbage dump… Rest in peace, computer! I remember the dumb people stories that cropped up after fax machines became more popular and plentiful. Like the guy who was using his floor’s machine as a long-way-around copy machine. We do have a fax machine at work and – believe it or not – I’m still sending fax messages on a regular basis. Some business partners still insist on it, especially for signed pages.